Why is Market Research Important for Messaging Strategy Creation? Why is Market Research Important When Creating a Messaging Strategy? A messaging strategy focuses on how and what the leadership of a company communicates to its consumers and potential customers, employees, vendors, and many more. No matter the platform being used to deliver this message, the message itself should be as transparent and consistent as possible. But, before the messaging strategy is created it is crucial to get to know the audience, most importantly the current and potential consumer. If a messaging strategy is to be successful you must first learn what the triggers are in a persons brain that initiate intrigue and establish belief. What engages consumers and how can you build and maintain their trust? In order to connect with customers, a company must convey relevant, educational, and timely information but how do you know what information is relevant to your customers? You can learn all of these things and begin creating a successful messaging strategy through market research. Market research is the process by which we get to know our current and potential consumers and determine the triggers that cause them to make certain purchasing decisions. Through market research we also learn about our competitors, and we learn if the current target market is actually the one that should be targeted or, if there is better potential somewhere else. There are different steps to take when conducting your research and each step can involve several methods. One of these steps is the competitive analysis in which you get to know your competition. There is a lot to learn about your competitors through analytical research online. You can find out how effective their websites are in communicating with customers, how they are driving traffic to their online platforms – including social media and blogs, what benefits they offer their audience, and much more. Analytics allow us to find which keywords are helping search engines find your competitors’ websites as well as determine where they may be ranked in search engine results. You can see how many other sites have linked to the competitors’ sites which also effects their search engine ranking – the more links they have coming into their site, the better their ranking. Besides search engine rankings, keywords can also help determine what type of audience the competitors are targeting and this can aid in creating or reevaluating your own target market. Understanding the market that you are competing in is essential to building a successful messaging plan that allows you to stay ahead of competitors. Once you’ve learned about the competitors’ target market and how they are engaging consumers you can start to evaluate your own target market. You can gain insights from your target market through several different kinds of marketing research. You can collect information from current and potential consumers using focus groups. This method takes a great deal of time and it can also be pricey. And, even though it can take months to get the final results it is an important form of research and can provide essential behavioral information. Face-to-face or “street interviews” are another form of marketing research. These spontaneous interviews are conducted in high-traffic, public places such as shopping malls and often include a free gift as an incentive for the participant to complete the interview. Web surveys are quick and simple but it is hard to tell just how accurate this form is since the participants aren’t seen face-to-face. It’s sometimes hard to tell whether a participant is really who they say they are which can cause some of your research results to be inaccurate. Highly-targeted, phone-based research uses neuromarketing, a very scientific technique, to trigger the person’s brain and get him/her to engage with you, establish trust (which is crucial), then expand on that trust and move them towards a next step. This is the quickest and most effective form of market research that can help you gain insight from your target market. You’ve collected information, now what? How will this information help? The insight you collect from your chosen method of marketing research can help you develop new target markets. After analyzing the results of your research you may find that there are other markets that could provide better or equal opportunities as your current targets. These could be markets that have just recently realized a need for your product or service that competitors have not yet perused allowing you a first mover advantage. You may also find that there is a whole new market that can be easily targeted just by using a new communication platform. Market research helps you to better understand the industry and markets that you are competing in by allowing you to learn about your competitors as well as about your current and potential customers. Once you’ve analyzed the final results of your market research it becomes much easier to understand what information is relevant and build a successful messaging strategy that will communicate to your stakeholders who you are, what you do, why you do it, and why people should care. 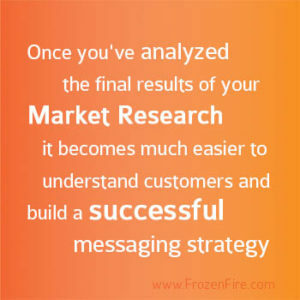 At Frozen Fire, we are market research experts that can help you identify these things and create a messaging strategy that will effectively connect you to consumers and optimize your communications efforts. Frozen Fire is a digital business development and communication strategy firm that exists so that small to mid-size businesses have the tools necessary to know exactly who their customers are and what their customers are looking for; we help companies connect with their customers via digital marketing strategies; and we help them to drive their sales, business development and marketing efforts, so as to gain the maximum return on their investments in terms of marketing dollars, efforts, and human resources. Contact us to learn how we can help your business know, connect, drive.